Last Friday, at the NYLA YSS Spring Conference, three co-panelists and I presented booktalks for an audience of about 50 fellow youth services librarians. Our topic was "In Be-'Tween' Reads" (see what they did there?) It seemed to go over well, but I can never tell with these things. At the very least, no one who attended our presentation fell asleep. You really can't ask for more than that. The other workshops I attended that day were interesting and informative, and it was nice to talk shop with librarians from various places around New York. JERRY: "Jerry Lewis is gonna be at this Friar's Club roast I'm going to next week. Now I have an 'in' to strike up a conversation with him." GEORGE: "You already have an in. You have the same first name!...Jerry!" JERRY: "Oh, that'll intrigue him." I admit, it wasn't exactly the best plan. 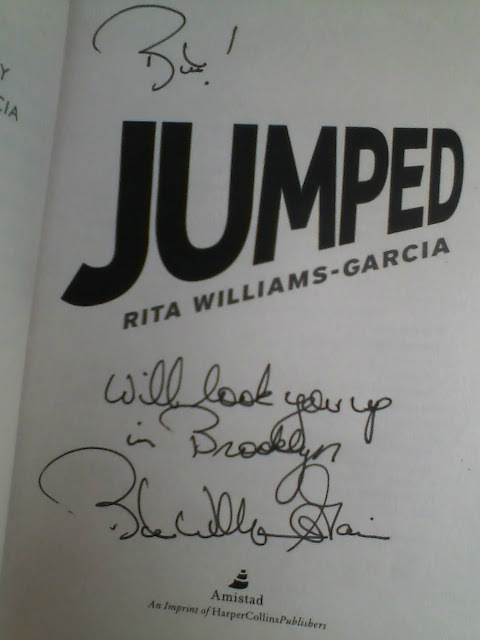 However, Ms. Williams-Garcia beat me to the punch and, being a seasoned book-signer, looked at my badge to see what my name was. Her response was an animated "Hey! Your name is Rita too!" And so began a friendship that I'm sure will last forever. See! She'll look me up in Brooklyn! BFF! Okay, maybe not. But we did have a nice little chat, and her luncheon speech at the conference was both entertaining and inspiring. Be sure to check out her books! 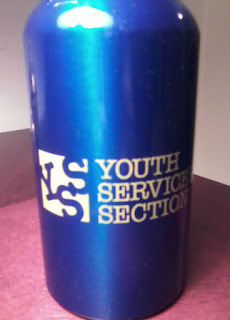 On top of everything else, as a gift for participating on the panel, I was given a nice blue water bottle (which will certainly be more appropriate than the one I currently have that says "What Makes You Think This is Water?") Yay for library conferences!